We work closely with our customers and listen to what they want for their screen doors and patio doors projects. Unlike others we provide an extra level of expertise – and our reviews prove it. Let us sit down with you and discuss your needs as well as what styles will work well with your home. – We sell and install aluminum sliding and aluminum swinging screen doors. 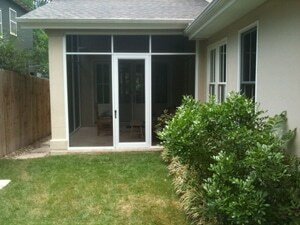 – We custom size all our sliding screen doors and they come with steel rollers both top and bottom. – We offer both a standard screen door frame and a premium sliding screen door frame. – We work with Phifer as our screen material supplier allowing us to put any screen type in our doors. – Over-sized doors are no problem! – We do not sell bi folding screen doors. Dan White’s Screens & Things has been the name to remember for all things screens since the business began in Mr. Dan White’s Austin garage in 1979. We are located in Austin and are well known for our exceptional quality in manufacturing our screen door and patio door products as well as our expertise in installation and repairs. Contact our patio and screen door professionals to talk about your questions, needs, and design desires today.